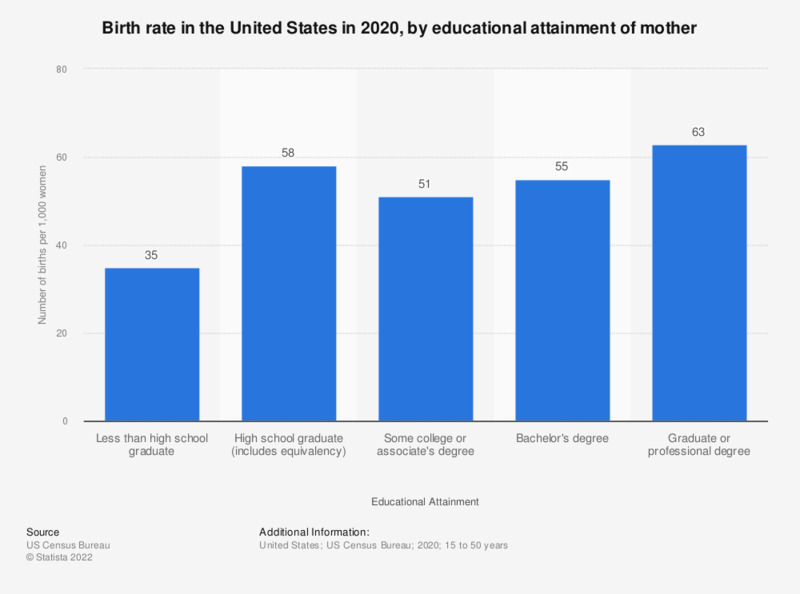 This statistic shows the birth rate by the educational attainment of the child's mother in the United States in 2017. In 2017, 55 children were born per 1,000 women who held a Bachelor's degree and 64 children were born per 1,000 women with a graduate or professional degree. The birth rate covers the number of births per 1,000 women. Covers civilian noninstitutional population. Since the number of women who had a birth during the 12-month period was tabulated and not the actual numbers of births, some small underestimation of fertility for this period may exist due to the omission of: (1) Multiple births, (2) Two or more live births spaced within the 12-month period (the woman is counted only once), (3) Women who had births in the period and who did not survive to the survey date, (4) Women who were in institutions and therefore not in the survey universe. These losses may be somewhat offset by the inclusion in the Current Population Survey of births to immigrants who did not have their children born in the United States and births to nonresident women. These births would not have been recorded in the vital registration system.